Emergencies can happen. Make sure you have a vet that will see pigs because they do get sick, they do get hurt and you need to spay/neuter, so regardless of what care you think a pig may need, a veterinarian that is agreeable to see your pig can sometimes be the difference between life and death. We do NOT know that each vet on this list specializes in the care of pigs, as a matter of fact, we would venture to say most do NOT. But a vet willing to see a pig in an emergency versus a vet that is knowledgeable about pigs can be the difference of a several hour drive. 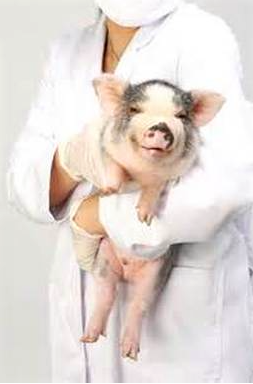 Always call ahead of time to be sure the clinic still has a veterinarian on staff that will see your pig. Please let us know if there are any changes that need to be made as well by emailing minipiginfo@gmail.com who is keeping up with the veterinarian list for us and them. Mobile Vet-services Logan, Lincoln, Oklahoma, Cleveland, Canadian, Grady, McClain, Pottowatomie, Seminole, Hughes, Okfuskee, and Payne counties. *Routine vet visits, will neuter but NOT spay.